Is Rewritable ID Card Technology a Fit for your Business? Does your company have frequent visitors who stay at your facility or building for a short period of time? Or are you looking for a way to avoid throwing away cards after one use? Call one of our ID specialist to discuss how rewriteable cards may work for your business or organization. Is ID Card Software Specific to a Printer? Most ID card printer manufacturers have their own software. Datacard’s TruCredential, Zebra’s ZMotif CardStudio, and Fargo’s Asure ID have various versions and levels of sophistication. All have general design capabilities, and then advance to allow for additional benefits including but not limited to centralized databases, visitor management, and network capabilities. But are the various software choices only compatible with the same brand of printers? The answer is no. The software mentioned above are compatible across brands. Your choice should depend on ease of use and features set. Datacard’s new TruCredential has an extremely easy user-interface and allows you to design process flows for your typical ID needs. The software, recently released, offers the best of multiple Datacard software (ID Works and TruPhoto). Always feel free to consult an ID professional with any questions on what is the best software for you. When deciding on an ID card printer purchase, a typical question is whether you intend to print on one side or both sides. Many sellers fail to dig deeper into the problem and ask if you intend to print color on one or both sides of the card. If you intend to print color on one side and black on the back, all dual sided printers can offer a ribbon to accomplish that. For example, the Datacard SD360 allows for printing on both sides and the standard ribbon is the YMCKT-KT. However, this choice of printer and ribbon doesn’t solve the need for full color on both sides of the card. If you know that dual sided color printing is the only way you intend to print, a single sided printer (Datacard SD260) with a full color ribbon (YMCKT), where you put the card through the printing process twice is your best bet. The process uses twice as much ribbon as a standard print, but does save you the cost of a dual sided printer. Until a dual sided color printer becomes available, your best bet is to use a full color ribbon and run the card through the printing process twice. Always feel free to contact one of our ID professionals with any questions on what is the best printer and ribbon combination for you. There has never been a better time to trade in your old printer and receive great discounts on all current Datacard printers. Now through march 15, 2013, enjoy the following incentive to replace competitors’ printers or upgrade existing Datacard printers and save up to $1,000. Program includes SD260, SD360, and SP75 Plus. In addition to the rebate, BarcodesInc can offer a variety of Datacard ribbons, software and ID cards for all of the models listed above. These items are in stock and ready to ship. Call us to find out how we can help solve your ID needs. Direct-to-Card (DTC) printing is the most common technology used by desktop card printer/encoders to transfer images directly onto a plastic ID card. DTC technology prints images by heating a print ribbon beneath a thermal printhead, resulting in the transfer of color from the ribbon to a blank card. With DTC printing, images have sharp edges, deep blacks and a full spectrum of colors. This printing method does not provide full card coverage as a small white border will be at the edges of the card. All major manufacturers produce DTC ID card Printers, with some of most popular models being Zebra ZXP Series 3, Datacard SD360, Fargo DTC1000, and Evolis Primacy. Retransfer printing is a two-step process that transfers your image to a retransfer film before applying it to the card. First, the image is printed in reverse directly onto a clear layer of film. Next, the printhead heats up and bonds the imaged film to the card’s surface by applying heat and pressure. The two step retransfer process creates a true edge to edge (100% card coverage) high quality image on PVC cards and other card types. High end models using this technology include Zebra ZXP Series 8 and Fargo HDP5000. Remember, when using a retransfer printer; don’t forget to add the retransfer film with your ribbon. For help finding the right ID Card Printer for your business, contact us at BarcodesInc. Are you looking to secure your ID card but don’t have the budget for a printer with lamination capabilities? Well, BarcodesInc and Zebra have the solution for you! Zebra’s “Genuine Secure” hologram overlaminate patch is hand-applied with its peel-n-stick feature, so a lamination ID card printer isn’t needed. Just simply, peel and apply up to 500 patches per roll. The overlaminate patch features a “Secure” text hologram that serves as an anti-counterfeiting measure and makes the ID card difficult to replicate. The hologram overlaminate patch can be used with all manufacturers’ cards, including Fargo, Datacard, and Evolis. For more information about ID card systems, contact us at BarcodesInc. Environment – Cards should be kept in the air-tight, water resistant containers when not in use. 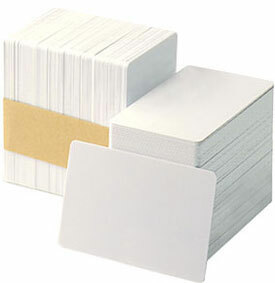 Most card stocks from Zebra, Fargo, Datacard, and Evolis come in 5 x 100 card packages. It is best to only open one container at a time. Cards also should be stored in a regulated temperature environment. Extreme heat or extreme cold can make cards brittle and more susceptible to snapping. Handling: Oils and fingerprints from your hands can leave a residue on the card that will impact the overall print quality of the card. We recommend only touching the edge of the cards when loading and handling your ID cards. Anti-static gloves can also be worn which will reduce the residue left on cards. Inputting: Always inspect the stock to make sure you have received the proper cards and no identifiable blemishes exist with in the cards. For more information about ID cards and handling, contact us at BarcodesInc. Datacard has been a leader in ID card printers due for their high quality printers that are easy to use. Their current SD360 and SD260 printers are a great for small to medium-sized applications for dual-sided or single-sided printing. The SD360 and SD260 card printer’s new technology, faster print speeds and user-friendly interface are designed to help any application streamline their day-to-day operations and create safer, more secure environments. Exclusive features include Datacard TruePick anti-jam card handling for reliable operation as well as TrueMatch color matching. When used with Datacard Certified Supplies, TrueMatch color matching produces vibrant images and logos, as well as crisp, bleed-free bar codes and text. Users can also upgrade the printers with smart card and magnetic stripe encoding modules for more complex operations such as meal purchases and attendance tracking. For more information on the SD series printers, contact us at BarcodesInc. When an ID Card Printer works successfully for so many years, it is easy to forget how long the printer has been in service. We get many requests from our customers who are looking to purchase another SP35 Plus to replace their existing printer. Unfortunately, the printer has been discontinued by Datacard and inventories have been depleted of the printer. However, Datacard’s SD260 is a direct replacement printer, which offers superior quality and a variety of configurations that will satisfy every customer. The Datacard SD260 single-sided card printer is packed with industry-leading innovations that make desktop ID card printing simple and economical. The SD260 printer is ideal for small- to medium-sized businesses, schools, hospitals, fitness clubs and anyone who prints ID cards as part of their busy workday. With its competitive features and price, the SD260 is a great value. 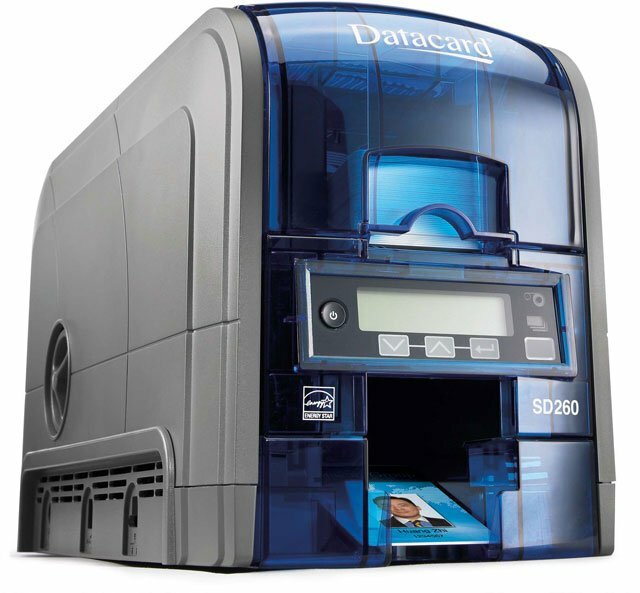 To learn more about the Datacard SD260 ID Card Printer, contact us at BarcodesInc. Making sure you have the right type of ribbon for your Datacard ID Card printer is crucial to getting the most out of it. That said, it is not always very clear what the types of ribbon are for especially when acronyms like YMCKT and YMCKT-KT are used. Having the right type of ribbon for your specific needs will help reduce media costs and increase your printing efficiency. The first concern when choosing a ribbon is if you are doing monochromatic(single color) or full color printing. Monochromatic printing is easy since the only concern is making sure the ribbon cartridge is matched to your printer model and the color you want. Most applications, however, need to print full color cards and this is where all the acronyms start coming into play. Most commonly, cards are printed in full color on the front and are either blank on the back or only printed in black. In both of these cases there are different ribbons that should be used to print accurately and efficiently.